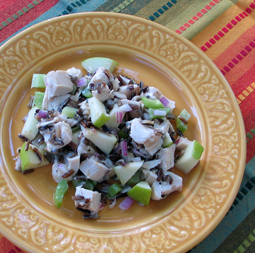 Apple, Chicken and Wild Rice Salad - A recipe from Savor California, the online showcase for extraordinary gourmet foods and beverages from California. Whisk together oil, vinegar, mustard, and salt/pepper to taste. Combine rice with chicken, celery, onion and apple in a large bowl.